This was my second time doing the sprint triathlon but the first time with the swim included. It was a very windy day so the conditions were a bit challenging but I was able to reclaim my title with my first place finish, see my SOAS teammates and watch my man run around the course to cheer me on. But once again, it was a great race and nice to run in my backyard. The expo was again at the Washington Hilton, but there seemed to be a less amount of booths. They also did not hand out drawstring bags this year which was a bit disappointing. On Saturday, I went and dropped off my bike at the transition area while it was starting to come down. It rained off and on on Sunday so we didn’t know if the swim would be canceled or not. Well, it wasn’t but the water temperature did drop which mean wetsuit legal. I had to get to transition early on Sunday because it closed off to everyone at 6:55 and then I got to wait around until 8:15 to get lined up to start. But that is what happens when the sprint starts after the Olympic distance. By the time the sprint started, the wind was really beginning to whip up as we could tell with the swim course. The chop was going crazy, the current was strong and my swim time was just not as fast as previous sprint times. 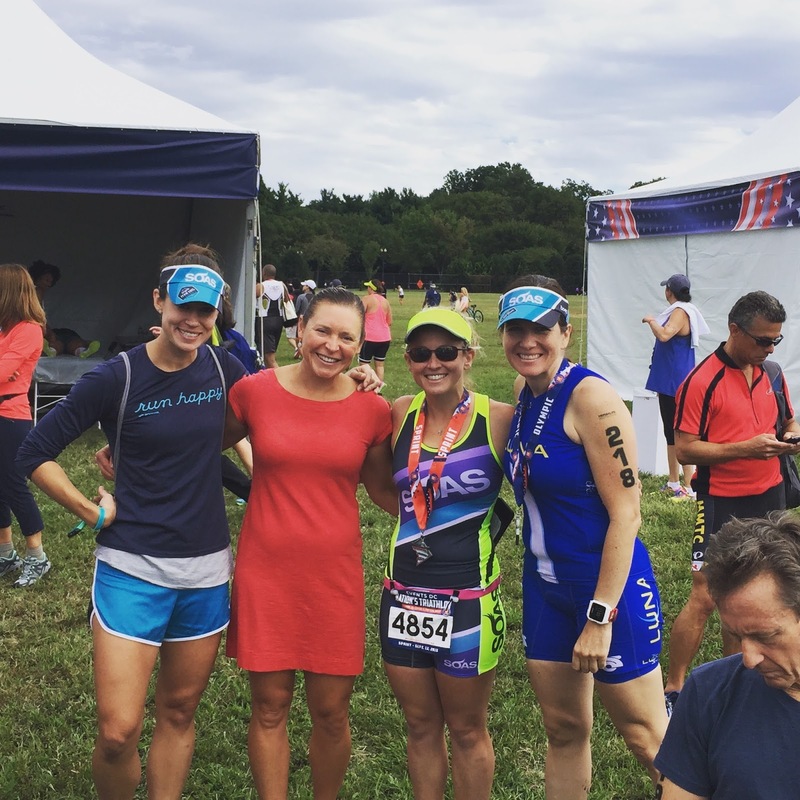 There was a long run to transition and the way transition was set up, they made the swim in like an extra 500 meters and then on top of that my bike set up was at the very end of the bike rack and I am talking about not in the aisle so I had ever farther to run. If I could make another note, I think the setup of having the swim in and bike in at the same entrance makes for a bottleneck when the sprint swimmers are coming in because the bikers are trying to dodge the swimmers and the swimmers are trying to dodge the bikers. My bike time was 43 seconds slower than last year and I would have to say the wind was to blame. I had to be extra careful on certain parts of the course because the wind was blowing me back and forth on the bike course. The worse was while on Macarthur and 395. They still keep part of 395 open to traffic so you can get the blown about thanks to passing trucks. I will say this again, I do not understand why the bike course for the sprint is 16 miles. 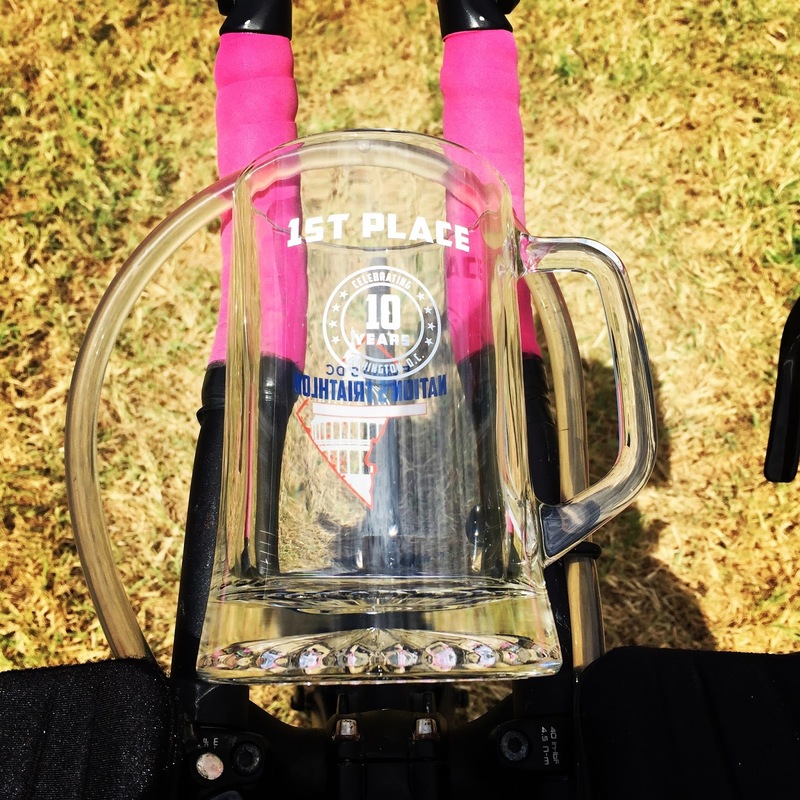 A normal sprint bike distance per USAT is 12.4 miles, half the distance of an Olympic. I also did not like the fact that there is a no passing zone during the bike course on 395. I do not think it is safe and smart. People were starting to bottleneck up in that section and I think they should get rid of it. There was no ramp for the bikes to jump the curb coming into transition which I wasn’t thrilled about. That and the run to my transition spot was a long one again, but that was just bad luck with placement. The fun part was the boyfriend found me in transition and was cheering me/making me laugh with his coaching/motivation. The run was probably the only part that wasn’t terribly windy but because it was cool, it made the run very comfortable. I found myself strong and had a really nice stride off the bike. Chris tried to run ahead to cheer me on at different spots along Independence and I guess I was easy to spot in my bright SOAS Speed Series suit and my Headsweats Supervisor. Overall, it’s wonderful to race in my backyard where I train, but it would be nice for them to improve some things about this course and venue set up. Perks: The run course, running in the nation’s capital, the medals were cute. Ehh… not a fan: The bike course being long, the no passing zone, transition set up with the swim in and bike in at the same entrance, making the sprint racers get to transition early only to have to wait for 1:30 hours.